These hand crafted Bread Boards are perfect for serving bread, appetizers, desserts and so much more. Could be used as a Charcuterie Board too....so fun! Choose from Ash, Cherry, Maple, Walnut and a few combinations as well. These make a perfect wedding or house warming gift...give them something that is hand crafted in the USA! Measures approximately 18" long x 6" wide x 3/4" thick. Hand wash, dry immediately (do not let air dry). Do not put in the dishwasher. 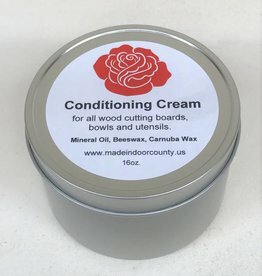 Don't forget our wood conditioning cream to keep your Bread Boards looking amazing!